If you’re craving something a little different than what you might find in your average grocery store, or you want some high end ingredients to really get creative with for a special dish you want to prepare, you can find inspiration at one of Toronto’s many gourmet and specialty food stores. Take your kitchen game to the next level or just try something new with a visit to one of the best places in the city to find unique and delicious items to stock your fridge and pantry with. You'll find the flagship location of celebrity chef Mark McEwan's gourmet grocery store at the Shops at Don Mills and a smaller location inside the PATH. Get everything you need for a good meal here including high quality produce, meats, cheeses and prepared foods from soups and salads to pizzas, pot pies and sandwiches. 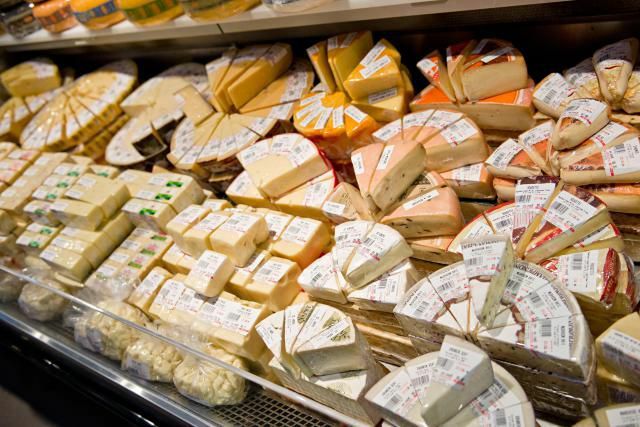 Anyone who loves cheese should make their way to the Cheese Boutique, but despite the name they deal in a lot more than just cheese and carry a seemingly endless variety of gourmet goodies. Whether you’re in the market for an obscure olive oil, a meal to take home from their extensive array of prepared foods, or you just really want to head straight for the cheese counter this is a great place for anyone with a love of food. If you’re a vegetarian in Toronto you need to make a trip to YamChops. The vibrant shop is Canada’s first and only vegetarian butcher shop and it has you covered for all your meat-free needs. Not only is the place to get healthy lunches in the form of boxes and bowls brimming with veggies, YamChops also makes a wide array of prepared salads, veggie burgers, soups, condiments, grilled tofu and much more. Now open at CF Sherway Gardens and CF Toronto Eaton Centre, specialty food store Pusateri's has expanded to include two locations of high end gourmet grocery store Saks Food Hall. In addition to the usual assortment of fine foods and gourmet meats, cheese and produce, Saks Food Hall also offers unique food experiences like a champagne bar at the Eaton Centre location for anyone who needs to take a luxury-inspired load off while shopping. You’ll find Max’s Market in Bloor West Village and be hard pressed to leave without buying something. The enticing aroma as you walk in the door is a good indicator you've found a good place to stock up on gourmet goods. The store is packed to the gills with gourmet items and there’s a long counter featuring prepared foods to take home in case you don't feel like cooking. Max's also features a good selection of cheese and dessert items. Shelves are stocked with everything from hard-to-find snack foods to baked goods, jams and jellies, olives and olive oils, pastas, dressings and sweets. There are two locations of this gourmet grocery store, one on Summerhill Avenue and one on Mount Pleasant Road. No matter which one you visit you’ll be able to shop fresh made prepared foods including pastas, quiches, pot pies, pizza and lasagna. In addition there’s a deli counter, fresh produce, baked goods and desserts. Roncesvalles is where you’ll find Stasis Preserves, which as the name suggests, stocks a variety of house made preserves and pickles. But that’s not all you’ll find here. The small shop also stocks artisan cheeses, salumi, baked goods and dairy with an emphasis on local, direct trade and organic items. In terms of the preserves, they’re made using only Ontario grown fruits and vegetables preserved at the height of ripeness for maximum flavor.